We specialise in exterior house washing. We can remove mould, grime, cobwebs and all types of staining to transform your home to a pristine condition. We only use the high-pressure cleaners on cement and paved flooring areas. The house wash itself is down to good old fashioned hard work using cleaning solutions and a soft broom we carefully scrub the surface of your home removing all soils and stains. ​Keeping the exterior of your home clean can do more than just make your house more appealing. It can also increase its value and extend the life of the products used to cover the outside of your home. It can save you painting your house before you need to! Not washing your home regularly allows mould, mildew, dirt and many other contaminants to become embedded in your home's exterior. And beyond the negative impact this has on your home’s street appeal, it will also quickly devalue your home and can over time destroy its exterior. 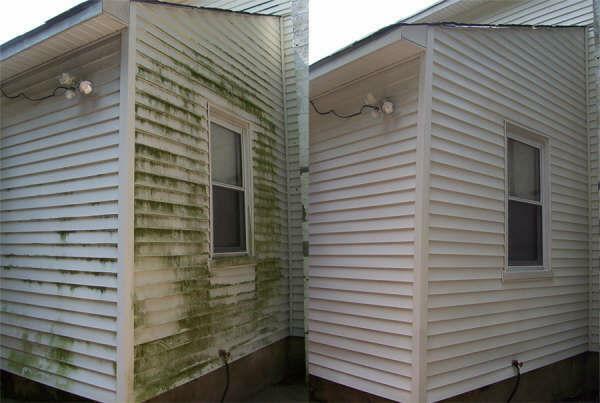 The process includes a double application of our cleansers that safely remove contaminants from your home’s exterior and inhibit future buildup. This is followed by a soft bristle brush scrub and a fresh water rinse.